Jom! Beli & Berumrah contest was held during Raya season from 15 Jun to 15 August 2013. Just purchase any product of Nona and Ori worth RM15 and above in a single receipt at Mydin. Total of 3786 submissions received from 27 Participating Mydin wholesale and supermarket throughout Malaysia. 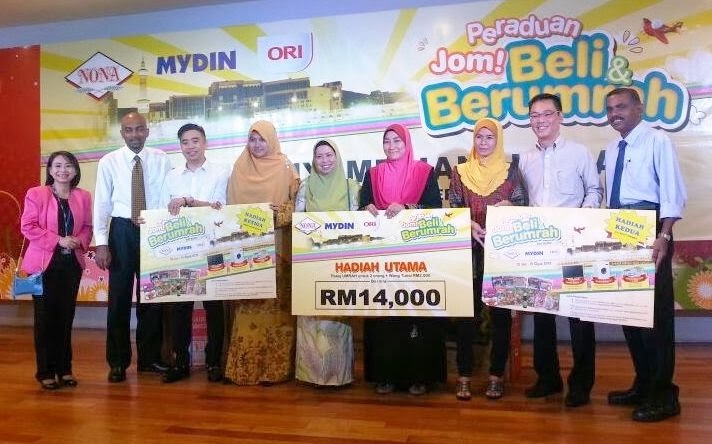 Congratulations to all the winners of Jom Beli & Berumrah bersama Nona, Ori and Mydin. Consolation Prize: 100 Mydin Vouchers worth RM50. The Grand Prize winner is Zurina Bt Hasbullah, she's from Kajang, Selangor. The Second Prize winner is Raja Zainah Bt Daing Kadir, she's from Seremban, Negeri Sembilan. The Third Prize winner is Shaidah Nafisah Bt Juhari, she's from Bachok, Kelantan. 13 participating products in Jom! Beli & Berumrah namely Sri Nona Ketupat, Sri Nona Oyster Sauce, and Ori Festival Biscuit.